After having a little too much to drink at a Dave Matthews Band concert south of Milwaukee, 19-year-old Travis Peterson decided to sleep in his car rather than attempt to drive. Yahoo News reported that Peterson said he was awoken by a state trooper who ordered him to leave because the lot was being cleared. Peterson obliged and began driving home. Once out of the parking lot, he was arrested for drinking and driving. Peterson was found guilty and ordered to spend 60 days in jail. On Wednesday, a Wisconsin appeals court commended Peterson for trying to be responsible and sleeping instead of driving. Yahoo News also reported that appeals trial court was wrong for not letting Peterson argue that police entrapped him. During the trial, the state argued that people who choose to drink too much can't argue they've been entrapped when arrested for drunk driving. The 2nd District Court of Appeals disagreed and said "drinking alcohol to excess, while inadvisable and unhealthy, is not unlawful by itself." While this argument holds strong, the court forgot to mention that Peterson was underage. Peterson's attorney, Andrew Mishlove said Peterson's age was irrelevant. There are several issues to address in this case, but the fact that a state trooper would actually order a teen to drive drunk just so a parking lot can be cleared is absurd. In 2006, Illinois had 540 alcohol-related fatalities, Alcohol Alert.com said. Illinois is also in the top five states to have the highest number of alcohol-related fatalities in 2006. Wisconsin had 352 alcohol-related fatalities in 2006. Above is a death clock that reads 7,002 deaths from drunk driving so far this year. This number I have addressed is subject to change. Learn About Alcohol.com reports that eight teens die every day due to drunk driving. Also, 60 percent of teen deaths in car accidents are alcohol related. These statistics may be scary but they are real. I doubt law enforcement officers are unaware of these numbers, so why would a state trooper encourage someone to get behind the wheel, especially after that person admitted they have had one too many drinks? It doesn't add up to me. Plus, I wonder if the cop that ordered the boy to drive is the same cop who arrested him. Or maybe he called in a patrol buddy a few miles away and told the officer to follow Peterson. Then again, Peterson was drunk and could have been swerving on the road. Instead of ordering Peterson to move his car from the parking lot, the officer should have offered him a ride home. I'm not saying that I condone teenage drinking, but this seems like a obvious solution to this entire problem. While I think the police officer acted irresponsible, I think Peterson is at fault as well. He should have been escorted home and received an underage drinking citation. Pantagraph.com reported that Illinois State Police said that their officers had issued 3,315 citations for underage drinking in 2006. It seems teens aren't taking the citations seriously, therefore, the Illinois House of Representatives is trying to pass a bill that will suspend a teen's license for three months if he/she is caught drinking. 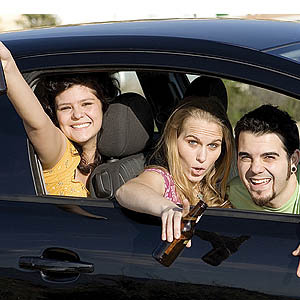 The odd part of this bill is that it also applies to teens who might not be behind the wheel. The resolution of this legislation is unknown at this time. Peterson will be spending 60 days in jail instead of paying a fine. It's a big difference and the state trooper should have been willing to drive him home instead of letting him endanger other drivers on the road. I'd also like to mention that the death clock above now reads 7,003. In the hour it took me to write this blog, another person has died because of drinking and driving. This is a crucial issue that needs to be taken more seriously. If you would like to get involved with distributing information about drunk driving then visit the following Web sites below.